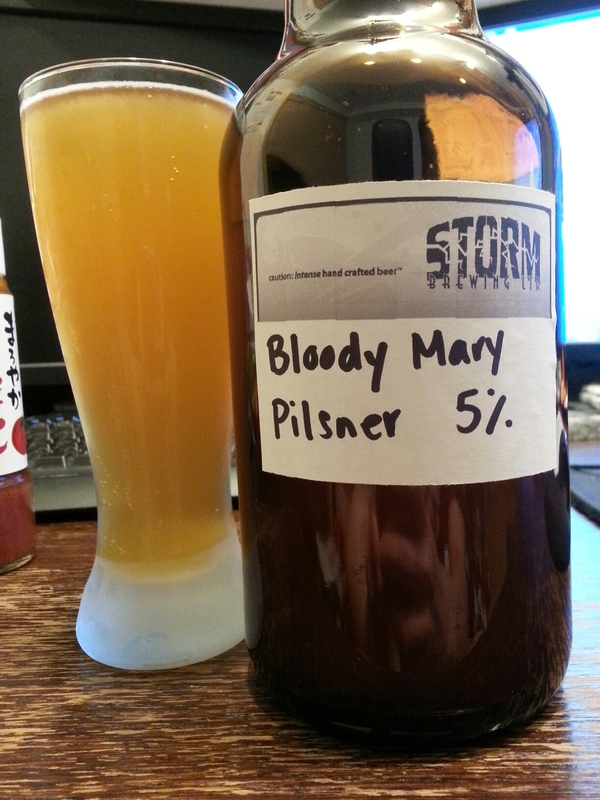 Bloody Mary Pilsner – Storm Brewing (Vancouver, BC, Canada) | Justintoxicated. -?!!! Bloody mary in a beer?! Lol what, this sounds very interesting… I’m a fan of Bloody mary’s and Caesar FYI. Brewed with tomato juice, limes and Thai chilies. Visual: (growler fill) Pours translucent orange with a reddish hue, thin ringed micro retention, non-sticky, a few steady streams in the center. Finish: tomato aftertaste, gentle lingering spicy kick, subtle bitter hops. Summary: Surprisingly done well and very drinkable. A good balance of sweet-spicy-aromatic without any unpleasant flavours. Probably not for all but I love tomato juice so I welcomed this.